As customers become more discerning in their choice of holiday homes, the popularity of Sirior Bach lodges has soared. We believe this is not least because we choose high-quality lodges such as the Arrondale and Rivendale from the Pemberton range. In addition, our Mountain View development is set in 19 acres of stunning Abergele countryside. As an exclusive country park, Mountain View has a 12-month license allowing owners to take holidays at any time of the year. Offering exceptional value for money the Arrondale Pemberton lodge is at the cutting edge of modern design. It has been finished with impressive glossy and chunky textures as you will see in the video below. A fully fitted kitchen with integrated domestic appliances would please even the most discerning chef. Retro style furniture, including a chaise longue, with interior décor in perfectly coordinated colours, creates a stunning appearance in the lounge area. Luxurious fixtures and fittings in the bedrooms with matching throws, blinds and curtains are included as standard. Vertical blinds cover the double doors leading out onto ample decking creating ease of access to the lounge through to the kitchen. There is plenty of room in the ensuite and ample storage for toiletries and towels. This lodge is sophisticated, luxurious and bears all the hallmarks of quality and attention to detail associated with the Pemberton brand. There is a choice of an open plan layout or closing off the lounge. This 2017 model makes the most of floor space by mounting the fire into the wall with space for a DVD too. Warm and light colours have been used for the interior décor that blends perfectly with the parquet effect floors and kitchen units. There is an option to have a utility room. The beams add a rustic touch. The master bedroom has a dressing room which leads to an ensuite and no expense has been spared in either of the two bedrooms on lavish furnishings, fixtures and fittings. Check out the video below for a virtual tour. 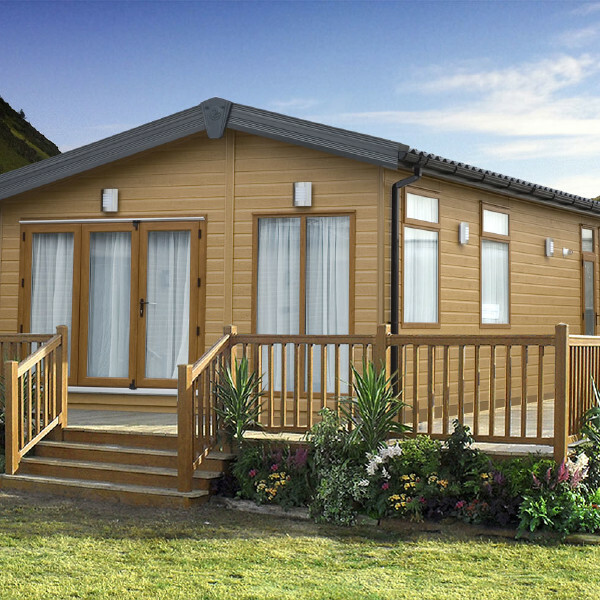 The Pemberton Rivendale is larger than the Arrondale at 40 x 20 and is also sold with decking and private parking space. Siting and connection are including in the sale price. For more details click on Pemberton Rivendale. We have a wide range of Sirior Bach lodges for sale not only from the Pemberton range but also from world famous brands such as Willerby, Atlas, Europa and Cosalt. Search on the Sirior Bach website for more lodges.